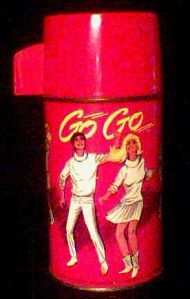 Groovy Go Go thermos in excellent condition with only minor wear. Generic theme. This is from the pre-Disco music days when people did dances like the Jerk, the Frug, the Mashed Potatoes, the Twist, and the Swim. Website design and hosting by Sohodojo Business Services. Item 186 of 466 items displayed in viewer. 0 items in cart.